April is almost here, which means we officially made it through winter. Patio season is fast approaching, so break out those Birkenstocks and ensure you welcome this month with an empty stomach. Bring on the rosé, seafood, and sunshine, here are some can’t-miss food events happening in Vancouver this month. This weekly series features a savoury dumpling menu, DJ Chris Allen spinning vinyl, and a flashy disco ball setting the mood. Plates are $10 and guests can choose from an assortment of decadent dumplings including nettle and ricotta with wild greens and pork and burdock with charred chili sauce. Popular local juicery and cafe The Juice Truck will be teaming up with Vancouver’s TMRW Foods for a drool-worthy weekly event. The Juice Truck’s Main Street location will host a weekly pop-up on Saturdays from 11 am to 3 pm. Formerly known as the Nat Bailey Farmers’ Market, the market was renamed after being changed to a year-round event. Visitors will be able to find over 30 producers and a selection of food and coffee trucks. The market also has amenities such as bike racks, an ATM on-site, and at times, live music. For the month of April, head to these two waterfront destinations and enjoy a glass of Oyster Bay Marlborough Sauvignon Blanc and had a dozen of oysters for $19, or one bottle of Oyster Bay Marlborough Sauvignon Blanc and a dozen of oysters for $55 all day. The Captain’s Boil is offering patrons the chance to live their best lives with unlimited mussels. As if tubs of mussels weren’t enough, seafood lovers can also enjoy bottomless fries – which means you can get your potato flex on too. This promo is $25.99 per person and starts April 1 and runs until the 14, giving you two weeks to make sure you get in on the deal. Enjoy Peruvian-Japanese ‘Nikkei’ style food paired will some of Portugal’s top wines at this feast on April 2. Origo Club is giving wine lovers the opportunity to showcase prized French vintages from their own cellars at this ultra-exclusive ‘Paulée’-styled Grand Cru Burgundy Dinner on Friday, April 5. The spirits-centric celebration will bring together 38 distilleries from across the province – veterans and newbies alike – to give attendees the chance to interact and taste samples from each and every one of them if they are up for. Try over 55 BC Wineries at the 12th Annual BC Uncorked. Attendees can also expect food from over 12 local restaurants, caterers, and food vendors. 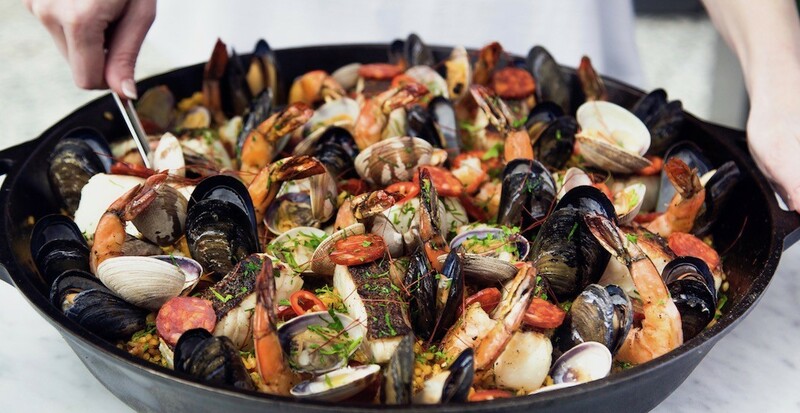 Boulevard’s popular Paella Dinner is back this month. Guests will enjoy the traditional Spanish dish during a three-course dinner, served with a glass of sangria. Head chef of Farmer’s Apprentice Bardia Ilbeiggi invites folks to a Persian spring food feast, which he’ll be making with his mom and dad. Expect family-style eats like salad, herbed rice, grilled fish, pickles, charcoal grilled bread, Persian lime tarts and more. Wildebeest Executive Chef Ian McHale will be joined by Roy Mckinlay of Canoe for this one-night-only culinary experience. Taking place on April 13 and 14 at Vancouver’s VanDusen Botanical Garden, this event offers attendees amazing spectacles, live performances celebrating, tons of food, and all things Japanese culture. Drags Benny, a series of pop-up events in Canada supporting national Pride initiatives, is offering Vancouverites the chance to attend its inaugural event next month at Juke Fried Chicken Chinatown. Enjoy rustic comfort food with a selection of rare and prized Brittan Vineyards wines during a five-course menu. Tickets to this screening of Game Of Thrones will include your choice of an appetizer, a main dish, and a dessert. Enjoy pre-show games and entertainment too. Head to Osoyoos Oyster Festival to try winning wines, craft beer, and cider, participate in oyster tastings, entertainment, and more in and around Osoyoos. This collab dinner offers two seatings at 6 and 8:30 pm where guests will enjoy a five-course menu with beer pairings. Guests will enjoy a multi-course Italian-inspired menu plus an informative overview of the wines that will pair with it. This is one of three wine dinners Cibo will host this season. The Greater Vancouver Food Truck Festival is back for its sixth year featuring delicious grub-on-wheels, drinks, and more. This year brings seven drool-worthy events from the Fraser Valley Food Truck Association, and the first one kicks off on April 27.